Beautifully engraved uncancelled certificate from the Washington and Chesapeake Beach Railway Company issued in 1893. 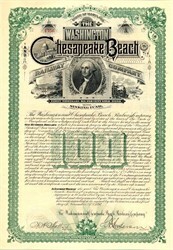 This historic document was printed by Homer Lee Bank Note Company and has an ornate border around it with a vignette of George Washington, the Capitol, a train and sailing vessel. This item is hand signed by the Company's President and Secretary and is over 119 years old. 60 coupons attached not shown in scan. The Town of Chesapeake Beach began as the dream of developers of the late 19th century who planned a grand resort on the shores of the Chesapeake Bay. 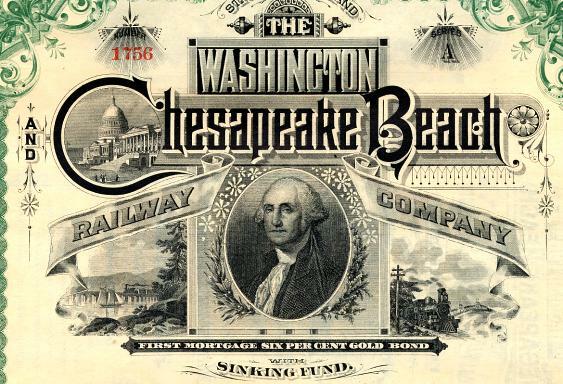 The State of Maryland granted a charter to the Washington and Chesapeake Beach Railway Company in 1891, and in 1894 the W&CBR was granted a charter to incorporate the Town of Chesapeake Beach. The grand schemes of the W&CBR were never to be implemented, however. A new company, the Chesapeake Beach Railway Company, took up the idea in 1896. This company completed the railway, and on June 9, 1900, the resort staged its grand opening. As the years progressed, the adjacent community of North Beach continued to develop as a neighboring cottage community. From 1900 until 1930 Chesapeake Beach was a thriving independent community. People would mainly come for day trips by railway and steamboats like "The Dixie" and "The Dreamland." Only 28 miles from Washington, D.C., people with more leisure time would flock to Chesapeake Beach for the cool breezes and salt water. Overnight visitors could stay in the luxurious Belvedere Hotel, which was built about 1900. It was located on the north side of 17th Street overlooking the bay before it was destroyed by a fire on March 30, 1923. The resort consisted of a boardwalk over the water and a pleasant park and picnicking area on the nearby land. On the boardwalk, one could find a bandstand, performing bears, games of chance, a carousel, casino, theaters, and many restaurants. A roller coaster, called "The Great Derby," was constructed over the boardwalk about 1900 and operated until the late 1920's. Fishing contests were held often. The picture to the left shows happy fishermen getting ready to leave the long pier at Chesapeake Beach for a fishing trip on the Bay about 1915. The Chesapeake Beach Railway brought people to the two beach town until 1935 when bankruptcy forced the railway to close down its operations. Seaside Park opened in 1930 and all the amusements were moved to land. In the late 1940s the management of the Park once again changed and so did the name; the park would be known as Chesapeake Beach Amusement Park until it finally closed in 1972.